GenreOnline.net: World War Z Blu-ray 3D Three-Disc Set Review. World War Z Blu-ray 3D Three-Disc Set Review. I watched the unrated extended cut of World War Z on Blu-ray Disc today. The extended version adds a few moments of character development and is basically the same movie with some blood spurts, but no banquets or even four letter words to have possibly garnered the film an R rating in my opinion, but I am not the MPAA and the reality is the film cost so much to make and may go down in history as the most expensive zombie film ever made for all time so I can understand why they made the theatrical cut as benign as possible. Regarding the 3D version of World War Z, the quality is good, but I found the colors to be a bit over-saturated. So I reset the 3D settings to factory default and everything from then on looked much better. The passive 3D effect was equal to what you get in a theater screening a film in Real D 3D aka fancy word for passive 3D with polarized 3D glasses. Sometimes I found the effect when you had a person in the foreground out of focus and then someone in the middle and then someone in the background to seem a bit distracting, but moments like that were few and far between. I consider the 3D to be good because there was one scene where I knew something was about to happen, but in 3D it made me jump. Since this is a action/thriller/horror film, the fact that it gave me a jolt in 3D even when I knew exactly what was going to happen is exactly what a film in that genre in 3D should do. Thus I consider the BD 3D to be a success on this film. The film looks fantastic and features a DTS-HD MA 7.1 soundtrack for both the Blu-ray 3D, and Blu-ray Disc versions. The theatrical cut is presented in HD in 3D, but the unrated extended version is only available on the regular Blu-ray Disc within the three-disc set, which also includes a DVD containing the theatrical cut and codes to download the theatrical version on either Ultraviolet or iTunes digital copy. The bonus features are all on the second disc containing the extended version. Unfortunately despite the featurettes and documentary all being directed by Laurent Bouzeraeu, everyone but Brad Pitt is interviewed for the film and though there is a bit of never before seen b-roll footage, the reality is considering all the press and publicity Pitt put into the theatrical launch of the film, you would think he would sit down for a few minutes to talk about it for the home video release. The one thing I think everyone really would have been excited to see was the entire half of the film that was scrapped even if it were only a work print, I think that would have been the most interesting part of the release. There are no deleted scenes even and no theatrical trailer as well. I found it odd that seem less branching was not employed so that both the theatrical and unrated cuts were on the 2D Blu-ray Disc. If you prefer the theatrical cut then the only way you will get to see it on Blu-ray is on the Blu-ray 3D disc. Since not everyone owns a Blu-ray 3D capable player let along a 3D ready HDTV and since a lot of people hate 3D in general, not giving consumers a choice on the regular BD in my opinion was an unfortunate oversight. Paramount's choice to include the extended version on Blu-ray and then only have the theatrical on Blu-ray 3D seems questionable to me because both cuts should have been included via seemless branching on both discs and why not give the user a choice regarding the cut on iTunes or Ultraviolet? As is I feel the way they set up the disc set as a whole is misaligned because of the choices not being universal to all media included and because what extra features I think people would want to see the most were not included. 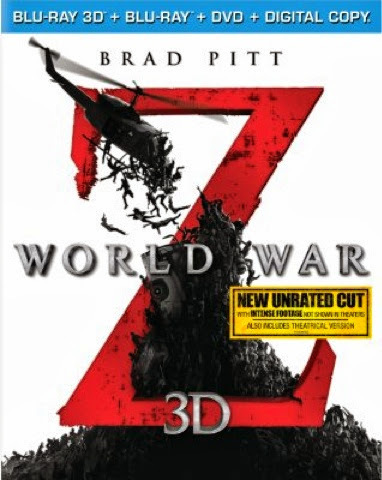 World War Z 3D is available now at retailers on and offline courtesy of Paramount Home Entertainment. It aired. We saw. It delivered. Thank You In Advance Of The Series Finale! The Big Bang Theory X2 Premiere. Revolution: New Season, But No Better. Who is Breaking Bad tonight? The zombie series that never ends. GenreOnline.net is coming to Google!